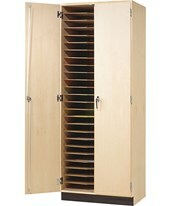 Need durable blueprint storage? Look into a metal flat file, also known as a: steel filing cabinet, steel blueprint file, or steel flat file. 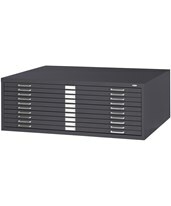 Made of heavy-duty, welded steel, metal flat files offer secure flat storage for your blueprints, plan drawings, and artwork. Most steel flat files come with a limited lifetime warranty, so you know they have been built to last. If you're concerned with indoor air pollution, choose a metal flat file with low chemical emissions. You'll have good long-term blueprint storage and help the environment too! Steel flat files come in different sizes, for documents from 18 by 24 inches to 36 by 48 inches. They offer many features to help make your life easier. Document depressors keep your files flat and label holders help you organize your files. 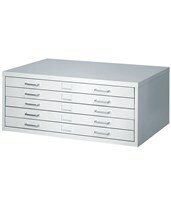 For convenient drawer operations, you can choose a metal flat file with easy-glide drawers that close with one push. Courtesy stops hold your drawers open when in use, and positive closures stop accidental opening. Locks keep your documents safe. 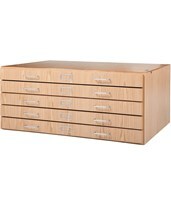 Steel flat files have 5 or 10 drawers and can be stacked for a customizable blueprint storage system. 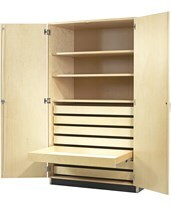 Choose a low closed base for a low profile or a high open base for some extra shelf storage. 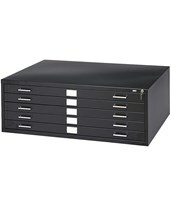 Standard colors for a metal flat files are black, white, beige, and grey. But if you want something special, some manufacturers offer custom colors. 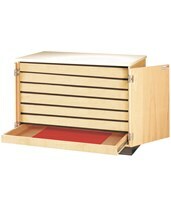 Tiger Supplies also has accessories for your steel flat file: drawer dividers to keep your files neat and tidy, levelers to compensate for uneven floors, and wheels to add mobility. Tiger Supplies has a great selection of durable, high-quality metal flat files from recognizable names as Safco, Mayline, Archive Designs Stacor, and Sandusky Lee. 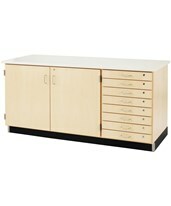 We're sure to have the steel flat file to suit your needs.